The Country Crochet Hot Pads are as functional as they are adorable. 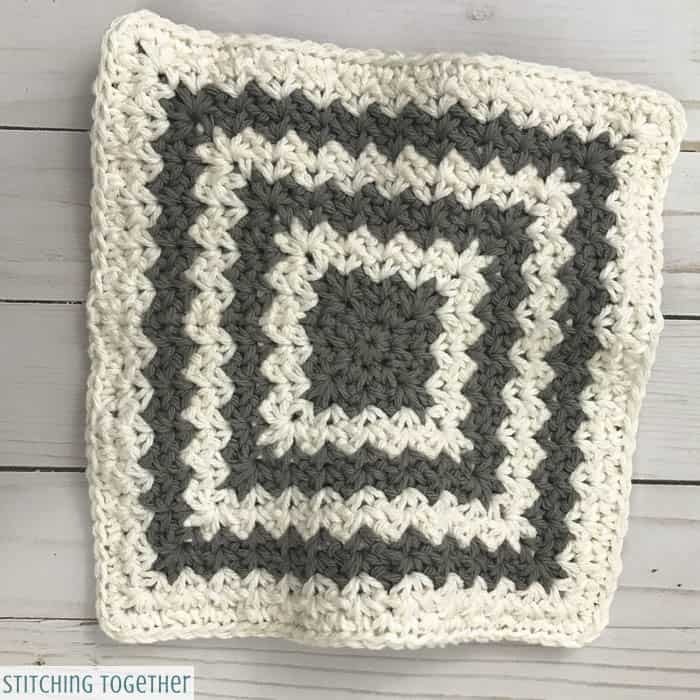 Use this easy pattern to make double thick hot pads which work well as a trivet or a potholder and can be modified to match any decor. 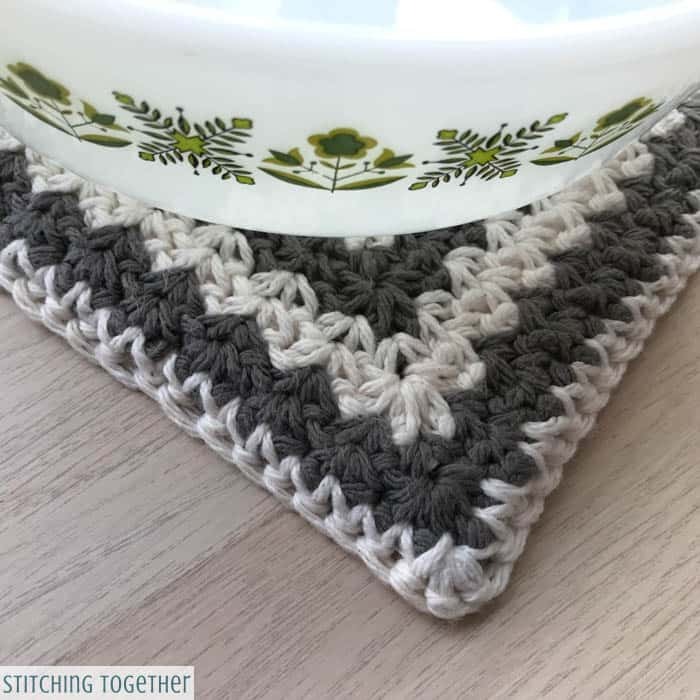 You’ll love that these crochet hot pads are big enough to hold a large dish so you won’t need multiple hot pads to protect your table from one hot dish (or hotdish if you’re from Minnesota). 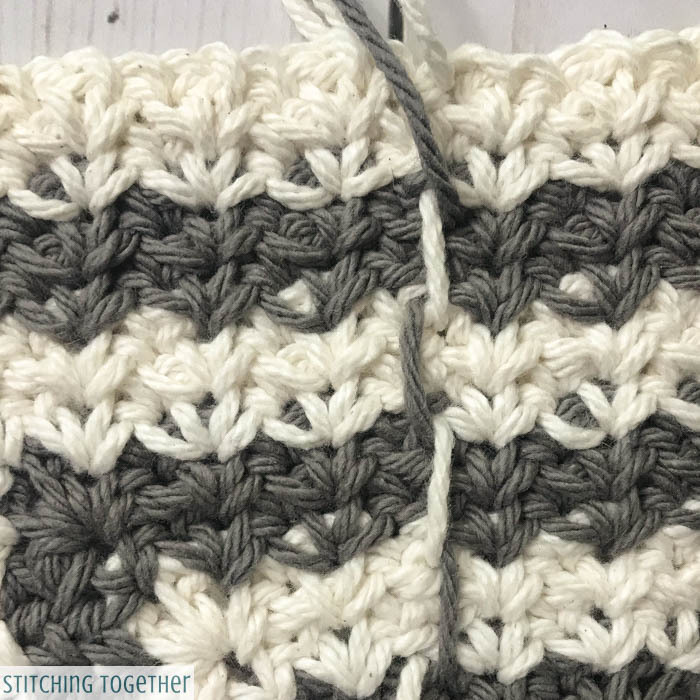 By using the spider stitch, which is a simple sc, ch 1, sc, all in the same stitch, you already get a fairly dense fabric, but by making and joining two sides, you get a wonderfully thick hot pad. 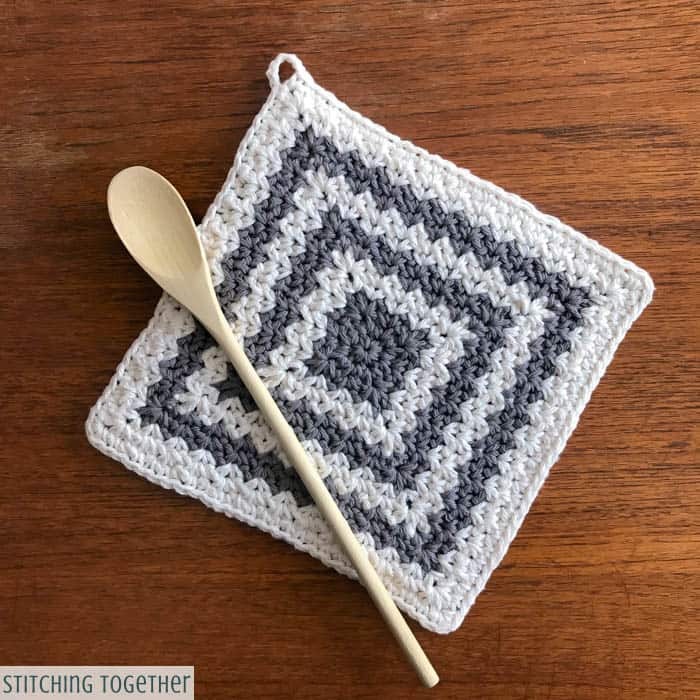 The style of the Country Crochet Hot Pad matches the rest of the Country Crochet line and gives great modern farmhouse style to this simple kitchen staple. They’d also look really cute as dishcloths and match the Country Dishcloths perfectly! If you decide to use other yarn make sure you use cotton and not acrylic. Cotton can withstand the heat of a dish from the oven but acrylic can leave you with a burnt mess. The crochet hot pads are worked from the center out using the spider stitch. Increases are made in the corner stitches every other row. 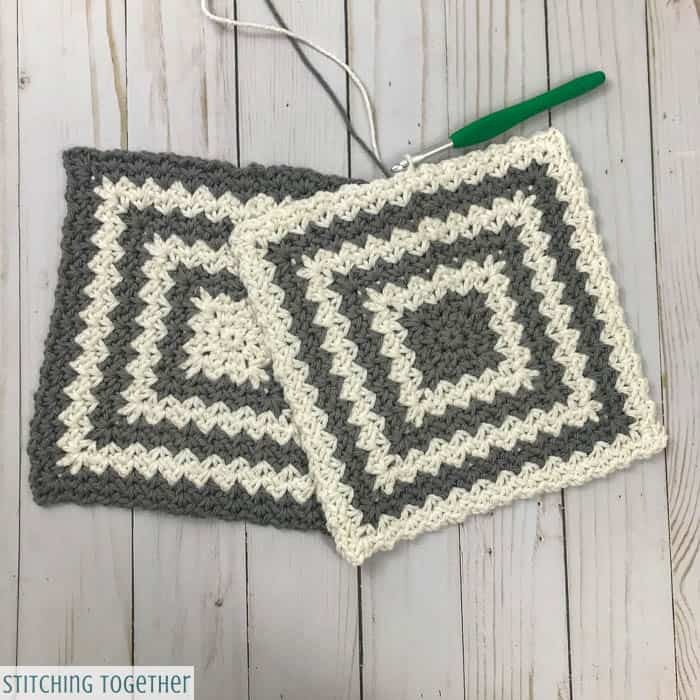 If you join two sides together to make a double thick hot pad, you can carry up the yarn as you do the color changes and don’t have worry about weaving in ends. After joining the sides of the hot pads, you may want to wet it and lay flat to dry while smoothing it out. I didn’t find it necessary to pin it while blocking. R1: ch 1, sc 8 in circle, join with sl st to 1st sc. R2: ch 1, (sc, ch 1, sc) in ea st, join with sl st to 1st sc. R3: ch 1, [(sc, ch 1, sc) in ch-1 sp, (sc, ch 1, sc, ch 2, sc, ch 1, sc) in next ch-1 sp] 4 times, join with sl st to 1st sc. R4: with CC, ch 1, (sc, ch 1, sc) in the next 2 ch-1 sps, (sc, ch 1, sc) in ch-2 sp, [(sc, ch 1, sc) in next 3 ch-1 sps, (sc, ch-1, sc) in ch-2 sp] 3 times, (sc, ch 1 sc) in the next ch-1 sp, join with sl st to 1st sc. R5: ch 1, (sc, ch 1, sc) in next 2 ch-1 sps, (sc, ch 1, sc, ch 2, sc, ch 1, sc) in ch-1 sp, [(sc, ch 1, sc) in the next 3 ch-1 sps, (sc, ch 1, sc, ch 2, sc, ch 1, sc) in ch-1 sp] 3 times, (sc, ch 1, sc) in next ch-1 sp, join with sl st to 1st sc. R6: with MC, ch 1, (sc, ch 1, sc) in the next 3 ch-1 sps, (sc, ch 1, sc) in ch-2 sp, [(sc, ch 1, sc) in next 5 ch-1 sps, (sc, ch-1, sc) in ch-2 sp] 3 times, (sc, ch 1 sc) in the next 2 ch-1 sps, join with sl st to 1st sc. R7: ch 1, (sc, ch 1, sc) in next 3 ch-1 sps, (sc, ch 1, sc, ch 2, sc, ch 1, sc) in ch-1 sp, [(sc, ch 1, sc) in the next 5 ch-1 sps, (sc, ch 1, sc, ch 2, sc, ch 1, sc) in ch-1 sp] 3 times, (sc, ch 1, sc) in next 2 ch-1 sps, join with sl st to 1st sc. R8: with CC, ch 1, (sc, ch 1, sc) in the next 4 ch-1 sps, (sc, ch 1, sc) in ch-2 sp, [(sc, ch 1, sc) in next 7 ch-1 sps, (sc, ch-1, sc) in ch-2 sp] 3 times, (sc, ch 1 sc) in the next 3 ch-1 sps, join with sl st to 1st sc. R9: ch 1, (sc, ch 1, sc) in next 4 ch-1 sps, (sc, ch 1, sc, ch 2, sc, ch 1, sc) in ch-1 sp, [(sc, ch 1, sc) in the next 7 ch-1 sps, (sc, ch 1, sc, ch 2, sc, ch 1, sc) in ch-1 sp] 3 times, (sc, ch 1, sc) in next 3 ch-1 sps, join with sl st to 1st sc. R10: with MC, ch 1, (sc, ch 1, sc) in the next 5 ch-1 sps, (sc, ch 1, sc) in ch-2 sp, [(sc, ch 1, sc) in next 9 ch-1 sps, (sc, ch-1, sc) in ch-2 sp] 3 times, (sc, ch 1 sc) in the next 4 ch-1 sps, join with sl st to 1st sc. R11: ch 1, (sc, ch 1, sc) in next 5 ch-1 sps, (sc, ch 1, sc, ch 2, sc, ch 1, sc) in ch-1 sp, [(sc, ch 1, sc) in the next 9 ch-1 sps, (sc, ch 1, sc, ch 2, sc, ch 1, sc) in ch-1 sp] 3 times, (sc, ch 1, sc) in next 4 ch-1 sps, join with sl st to 1st sc. R12: with CC, ch 1, (sc, ch 1, sc) in the next 6 ch-1 sps, (sc, ch 1, sc) in ch-2 sp, [(sc, ch 1, sc) in next 11 ch-1 sps, (sc, ch-1, sc) in ch-2 sp] 3 times, (sc, ch 1 sc) in the next 5 ch-1 sps, join with sl st to 1st sc. R13: ch 1, (sc, ch 1, sc) in next 6 ch-1 sps, (sc, ch 1, sc, ch 2, sc, ch 1, sc) in ch-1 sp, [(sc, ch 1, sc) in the next 11 ch-1 sps, (sc, ch 1, sc, ch 2, sc, ch 1, sc) in ch-1 sp] 3 times, (sc, ch 1, sc) in next 5 ch-1 sps, join with sl st to 1st sc. 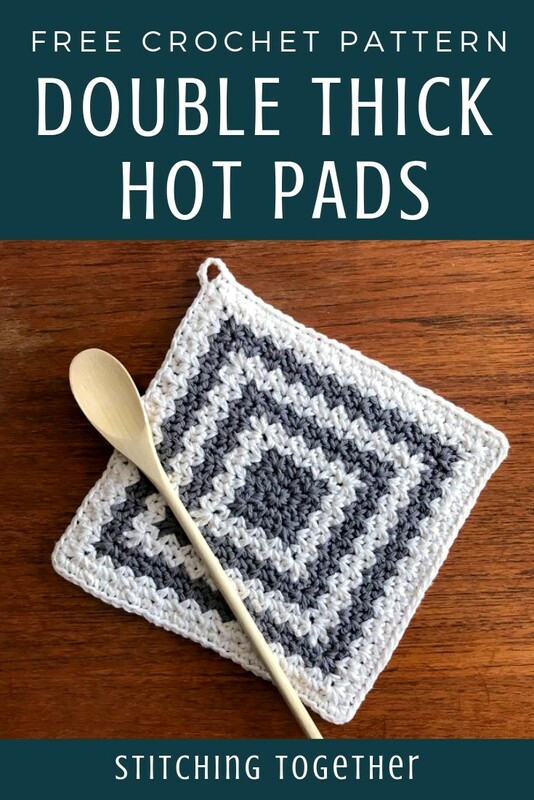 To make a double thick hot pad, make a second side and hold the wrong sides of the hot pads together and single crochet around the entire edge of both hot pads, putting 3 scs in each corner. To add a loop for hanging the hot pad, sc, ch 7 and sc in one of the corners. Continue single crocheting around. Where can I find your video on this? I’m not seeing a link. Have also looked on YouTube and can’t find your channel. 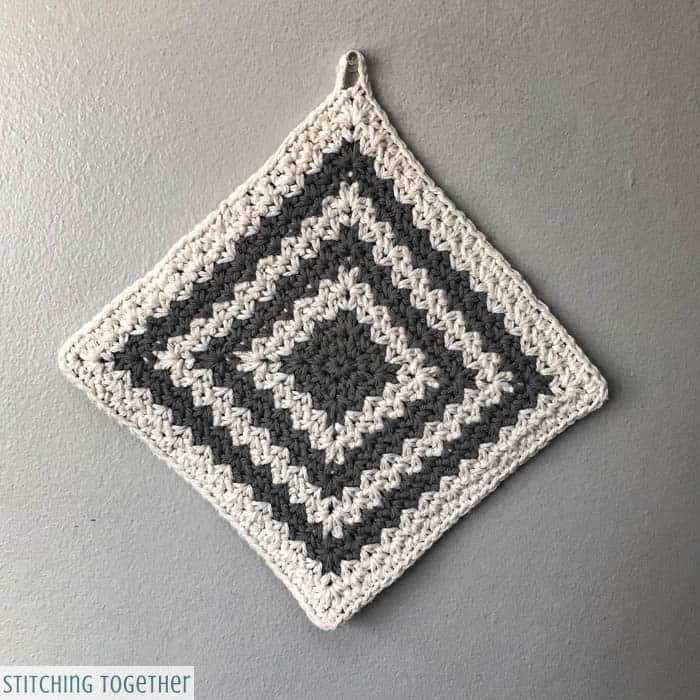 Darling potholder pattern! This is perfect. I am redoing my kitchen.